Boldin was originally recruited as a quarterback out of high school, but shifted to wide receiver. Following a promising sophomore year in which he caught 41 passes, Boldin missed all of the 2001 season due to a knee injury suffered during preseason drills. He came back the next year to catch 65 passes for 1011 yards and 13 touchdowns. 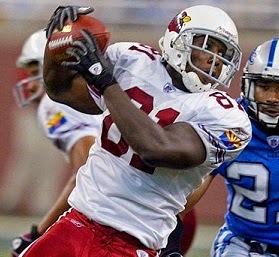 While there were concerns about his lack of ideal speed, Boldin was chosen by the Cardinals in the second round of the 2003 NFL draft and made an immediate impact by setting a single-game rookie record for receiving yards in his first regular season contest. Cardinals went 4-12 to finish fourth in the NFC West. Boldin missed six games due to a knee injury in 2004 and ended up with 56 catches for 623 yards, and while he was still bothered by knee problems in ’05, he bounced back with a career-high 102 receptions for 1402 yards in 14 games. Tough, strong, and fearless across the middle, Boldin was part of an outstanding wide receiver combination with Larry Fitzgerald. He was selected to the Pro Bowl twice more with the Cardinals, in 2006 and ’08, and over the course of seven years with Arizona in which he continued to fight off injuries, he accumulated 586 catches for 7520 yards and 44 TDs. However, Boldin grew dissatisfied and was dealt to the Baltimore Ravens in 2010. His production dropped in a different offense, but he remained an outstanding possession receiver and added another 186 receptions for 2645 yards and 14 TDs over the course of three seasons capped by a NFL title in 2012. Boldin moved on in a trade to the 49ers in 2013, catching 85 passes (his most since his last year in Arizona) for 1179 yards and 7 scores. Through 2013, he has accumulated 857 catches for 11,344 yards and 65 TDs and been named to the Pro Bowl on three occasions.